Our new Product Launch Program is broken down into various stages which will take your program from concept to delivery. Concept: Our Marketing Specialists will meet with your staff to either develop your current idea or show you new ideas to suit your packaging needs. Once a concept has been settled upon, our design team will develop this concept into three dimensional drawings and a working model as well as develop new colors. Once a final design is in place our mold design team will design the actual tooling necessary to manufacture your product. Benefits: Use our innovation to keep you one step ahead of competition. Use our product engineering to ensure a robust package. Use our solid modeling and 3D drawings to convey the idea to everyone in your organization. Take advantage of our custom color development at no additional cost. 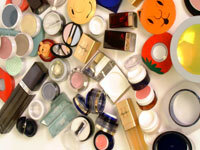 Capabilities: Our design team consists of individuals with a lifetime of experience in the cosmetic packaging field. There is nothing related to cosmetic packaging that is beyond our reach including: 3D Drawing, Modeling Shop, and In-House Custom Color Development. Concept: Based on the product's conceptual ideas our Design Engineers will draft all the required plans and submit them to you for a final approval along with a physical model. Next, our tooling engineer will begin designing the tools and our Project Coordinator will begin managing and tracking your project. Models Making: We produce either high quality hand made models or overnight rapid prototyping models. 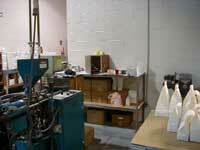 Part Engineering & Design: Dedicated specialists ensure highly functional and attractive products. Allianced Toolmakers: Strategic global partnerships with tool makers leads to better timing and better pricing. Concept: We have an in-house Color Matching Laboratory where we formulate colors for both plastic and paint. Benefits: Match any color with a quick turnaround. Greater accuracy in color matching and greater consistency in color reproduction. Develop your new color in our lab at no cost. Color Inventory: Whether it be plastic color or paint color, we maintain hundreds of different pigments. Color Matching: 25 years experience matching colors gives you fast-reproduceable color matching. Extrusion: We compound our own color concentrates for greater control and fast turnaround.